"We all prepare for things every day. Illustrate preparedness in a photograph today"
I'm going for a two-fer today with this shot, since yesterday's theme was "Use a window or a door as a frame for your subject today in a photograph." Cheater, cheater, and all that. This is one of the several classrooms that I call home. 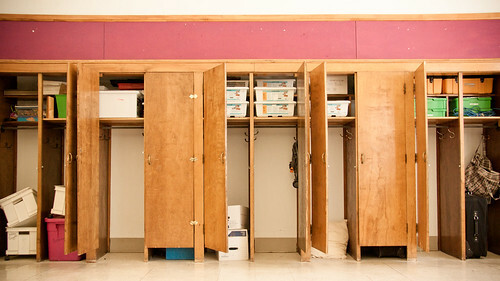 We store a lot of the 'stuff' for our program here as the cupboards stretch all the way along the back wall. Our program is very open-ended in nature and every session, we'll have a students ask if we have some particular object or supply. Chances are, it's somewhere in here.